Easter is approaching and we are thrilled to share some great experiences with you. And this Easter we’ll be there with bells on! Aside from our regular classes, read below for details of our four special stand-alone workshops which Sam and I are proud to host. They are scheduled in order to have you feeling stunning by the end of the extra long weekend. They are all a little bit of theory (because it’s important to get your brain on board), and a whole lot practical. The longer format will let you explore deeper than we can take you in the usual shorter class formats. We promise each session will give you great insight and significant inroads into the topic of the day. Beginning and advanced students will reap the rewards of these explorations. You can book into a single workshop or come to all four. And you can even craft a full four day retreat by adding on your choice of regular classes to complement. For example, do a barre, yoga or Pilates class Saturday morning, and then spend the afternoon loosening your hips, and enhancing your friendship with your breath. After developing your inversions and backbends on Sunday, glide straight into our regular yin class at 4pm. Blitz it anyway you want. See you getting strong and slinky soon! Attend Any or All of our Special Themed Workshops. Yes, It Is Possible to LOVE How Your Neck and Shoulders Feel! You don’t have to put up with tightness or pains anymore. In this practical workshop we will first shine the light of awareness into your movement habits of your neck, shoulder and jaw. You will learn about the essential balance between stability and mobility in the joint complexes of this region. Find out where your personal tensions lie and how best to release them. Practice quick and easy creative new releases. Absorb interesting fresh moves and new stretches you will love to take home. Understand how to give your upper body the best chance to live pain free and absorb healthier holding patterns. This workshop will give you tools you need delight in the freedom of a whole new healthy relationship with your neck and shoulders. Notes provided. Suitable for all levels. Date: Easter Friday 19th April. Breathing for Vitality, Energy, Focus and Calm – and Happy Hips Too! During this practical workshop you will prepare the body for breathing with special ‘breathing stretches’ so the rest of your body will feel wonderful. You will work through a sequence specially designed to loosen your hips to bring comfort to your seated work. After taking in the anatomy of your breathing (which muscles are most important and which muscles could be overworking) we will bliss our systems with practices to enthuse and delight. You will explore the power of your breath when it is natural and unaffected (deeply relaxing!). Discover how to reset your breath as preparation for a busy day ahead and to help you have a restful night’s sleep. You will practice different breathing techniques for increased vitality, for focus and as an anti-anxiety tool. You will really connect in and emerge supremely relaxed and freshly easeful in body, heart and mind. Notes provided. Suitable for advanced and beginner students. If you want to develop your backbending strength and flexibility, this workshop is for you. And if you want to reap the rewards of the yoga inversions, this session will take you as far as you want to go – whether it’s those initial beginning steps to free balancing. After a thorough warm up for the whole body this session we will break down the components you need for safe inversions and satisfying backbends. Everything will be given at your level. We will work in layers so you will always have a safe and productive option for you. Find out which inversions suit your body type best. Develop your shoulder flexibility for forearm balances (on and off the wall) and find out how to get a stunning safe shoulderstand (with various props as needed). Find foolproof tried and tested ways to get yourself up in a handstand. Get the right mix of shoulder strength and suppleness you need for headstands. (and take up a fabulous non-weightbearing option if your neck is not yet ready). Find out how to use the yogic energy locks (bandhas) to protect your back while backbending. Discover where your particular limitations are and learn which postures or strength work would best work unravel the restrictions. Enjoy a delightful sequence of finishing postures and a long relaxation which will leave you feeling nicely balanced after this energy boosting work. Suits all levels and abilities. Float Out with Loads of New Tools to Decrease Tensions in Your Body. This fascia release session is a must for anyone who sits at a desk, drives a car, carries a baby, or wants to enhance their ability at their chosen sport. Often we are so used to unhelpful holding patterns we don’t notice they are there. Expect to feel really different after this session – in a good way. Fascia is a specialised system of the body that has the appearance similar to the white stuff you find on an orange. Fascia is very densely woven, covering every muscle, bone, nerve, artery and vein, as well as all of our internal organs. Repetitive or poor movement patterns create myo-fascial restrictions that can produce unbalanced pressure within our bodies and affect our overall posture. This is a feel-good workshop which gets rid of embedded tensions. You are in complete control of how deep you want to work each area. The combination of longer postural holds interspersed with deep tissue release using various pressure tools is a winning combination releases your body will thank you for. You will feel much more released and comfortable in your body after this class and you’ll be armed with great take home practices. This workshop is perfect for any levels and ability. Notes Provided. 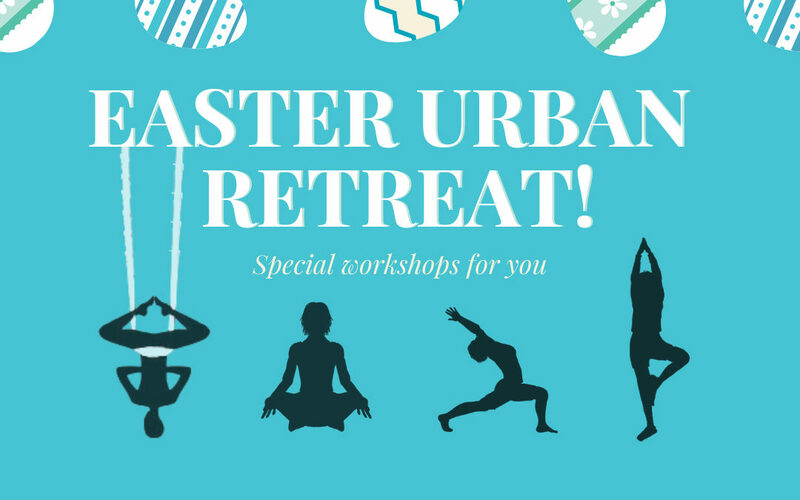 Build Your Own Full Day Easter Retreat. (All four workshops plus unlimited general class attendance over Easter) $240. Mix it up anyway you want, as much as you want. For example, blitz it with a barre, yoga or Pilates class Saturday morning, and then spend the afternoon loosening your hips and enhancing your friendship with your breath. After developing your inversions and backbends on Sunday, glide straight into our regular yin class at 4pm.